Young workers are at the front of the line when it comes to workplace vulnerability. One-third of reported workplace injuries are from young workers. 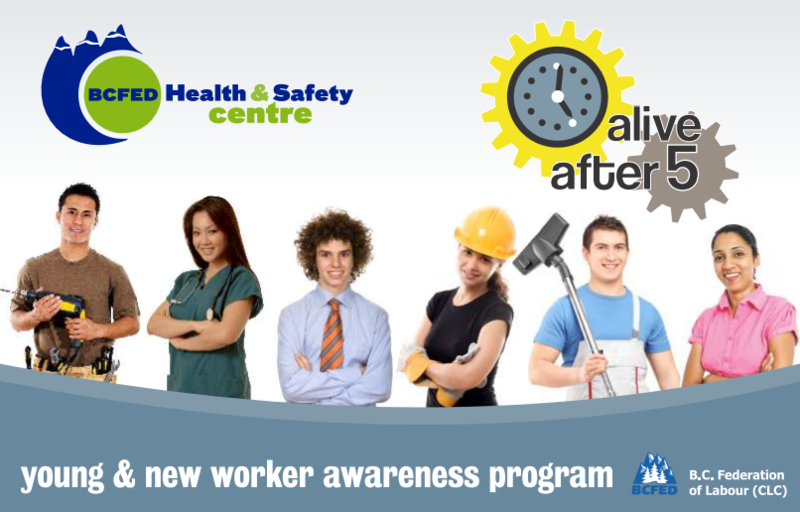 The Alive After Five Young Worker Awareness Program of the BC Federation of Labour is an innovative initiative that seeks to make the province a healthier and safer place to live and work for all of us. Since its inception in 2003, the Alive After Five program has directly spoken to more than 150,000 high school students and employment centre participants. The program has reached over 75 different communities throughout all the different geographical regions of the province. Through hard work and dedication the initiative is now growing exponentially in its capacity with the ultimate goal of reaching all young and new workers in the province. Alive After Five young workers deliver interactive and engaging presentations. We offer free on-site workshops at your school, apprentice program or employment program. We distribute our 20-page, full-colour booklet for students during workshops and around the province free of charge. For a list of additional online information, check our page on Young Worker Resources. All of the Alive After Five presenters are young workers themselves, primarily between the ages of 21 and 30. These presenters share personal insights, humour and preparedness for what to expect once in the workplace. Alive After Five trains young workers to become presenters of occupational health and safety workshops for students.